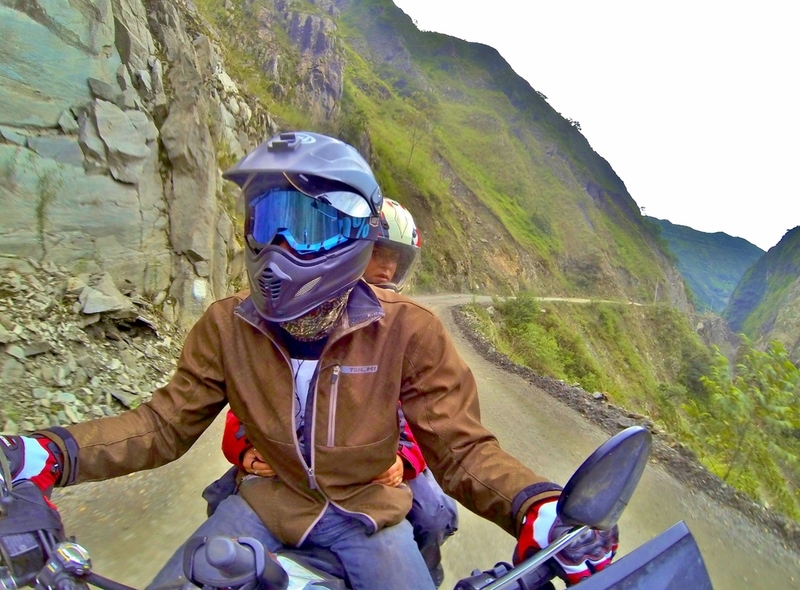 After replacing a few parts, tightening up some others, lubricating every last millimeter of chain, and making a huge mess in the lobby of the hostel, I had been suffering major motorcycle withdrawals. 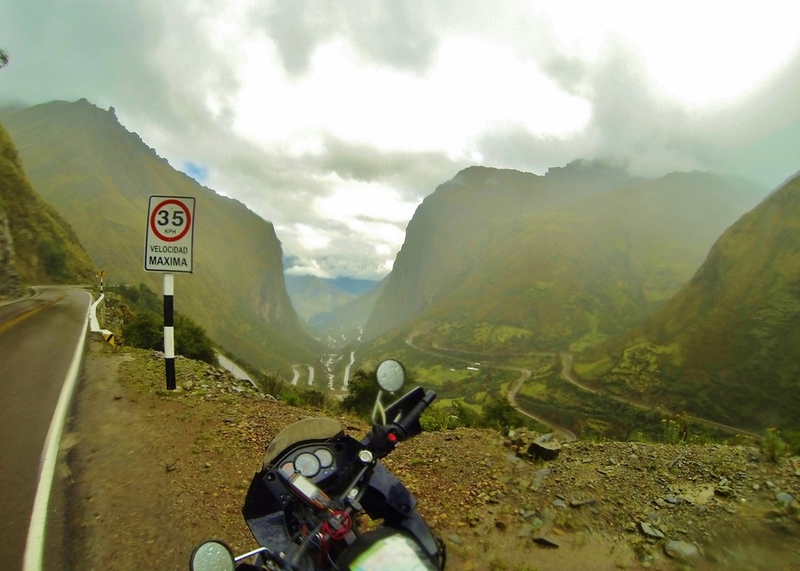 I knew of a "back way" to Machu Picchu that could only be reached on foot or, coincidentally, on a super awesome motorcycle. This road takes you to a hydroelectric plant on the south side of the mountain, opposite the tourist hub of Aguascalientes. Unfortunately my original arrival in Cusco was more than a few days behind schedule, so my girlfriend and I had to take the usual bus/train combination to reach Aguascalientes. 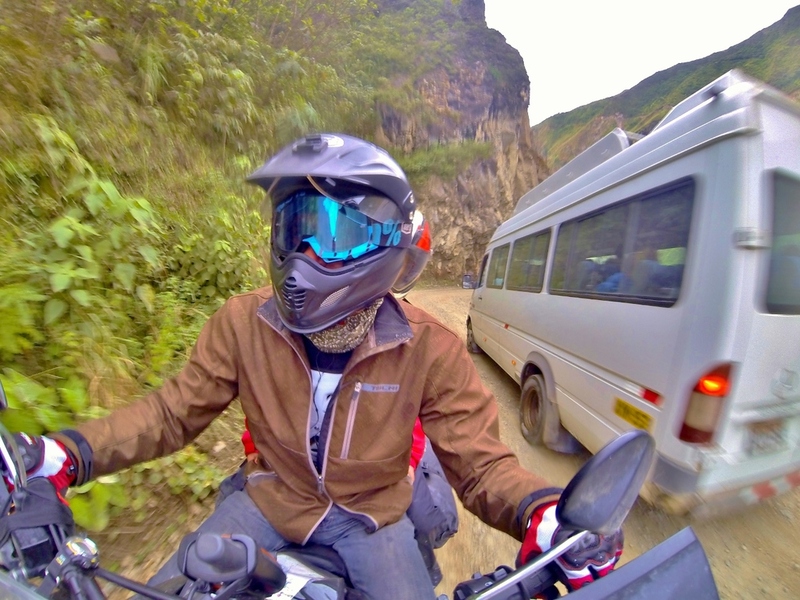 Even though I now had the time to ride the bike there, I didn't have the money to cough up for another visit to Machu Picchu. The excuse to go came to me one afternoon while perusing the San Pedro one day for some pajama pants, where I met a Norwegian girl named Elise. She'd spent a while in Brazil, Argentina, Chile, and Bolivia, but had just arrived in Cusco that day after a couple of failed attempts to take a bus from Arequipa. She wasn't the first person I had heard who had trouble getting to Cusco by bus on account of the frequent strikes. On strike days, demonstrators block the main roads with rocks, trash, and tires, often setting them on fire for good measure. A group of Europeans had arrived at the hostel a few days earlier, red-faced and some of them nearly in tears. Their bus had run into a burning roadblock outside the city, so they dismounted and carried their luggage the remaining six miles to the hostel. Part of me smugly thought "well I bet that makes you wish you hadn't packed so much, doesn't it, you prissy first-worlders?". Another part of me was very glad I didn't have to carry my luggage. After successfully running the strike blockade on the highway east of Cusco, Elise only really knew that she wanted to go to Machu Picchu. I told her about the various ways to get there, making sure to mention the road to Hidroeléctrica, feigning humility when I mentioned my motorcycle back at the hostel. "I could give you a ride....but you would need to find a helmet," I said with the assumption that she would never agree to it. To my surprise, her innocent Scandinavian appearance concealed an inner badass that had scars from sandboarding in Atacama and mountain biking on the Death Road in Bolivia. By the end of the afternoon she'd found a helmet and told me to pick her up in the morning. 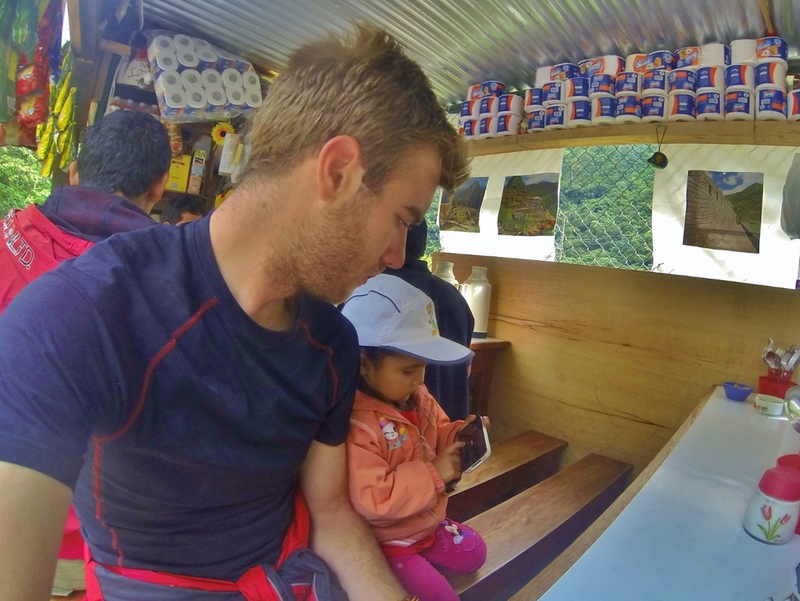 The next morning, an hour after the time I was supposed to pick up Elise, I was still trolling the streets of Cusco looking for gas. Yet another strike meant the gas stations had to close, and stones had been strewn across the streets to block the city's most important intersections. Cars couldn't pass the small stone barricades, but it was easy work on a motorcycle so long as you don't mind the insults from the protesters on the other side. Luckily for me the roadblock near my hostel had been turned into a concrete soccer field, so the players--er, protestors didn't mind me. Eventually I found a long line of cars around the corner from seemingly the only place in Cusco still selling gas. By lunchtime we were in Ollantaytambo, the end of the line for automobile traffic en route to Machu Picchu. From here most tourists take the train or hike the tracks to Aguascalientes, but the road to Hidroelectrica took us directly north, up the switchbacks on Mount Waynawillka to the cloudy pass of Abra Málaga at over fourteen-thousand feet. Things began to fade away as we continued up the mountain. The villages were smaller and smaller until we only passed solitary houses that were ever more remote from the one before. The forest thinned until there were no more flowers, then no more trees, only slopes of grass with small herds of sheep or horses, then utter tundra of bare rock at the frigid top of the mountain. We rose until we were completely surrounded in clouds that obscured the peaks above and then the valley below. The foggy veil closed in around us until all we could see was the twenty feet of asphalt in front of my tires and the grey void where the mountain slopes dropped off out of sight. Once at the top, we plunged down the other side of the mountain as the fog cleared to reveal the dripping wet, steamy jungle I had imagined for so long. The valley ahead stretched into infinity in a lush green V as it followed the Rio Luq'umayu. Down the mountain we dodged mountainbiking tourists in panchos as gravity pulled them faster and faster down the slick mountain road. A series of cascades gushed from the mountain and over the road, and despite my best efforts I'm certain I accidentally sprayed a biker or two while plowing through the water crossings. 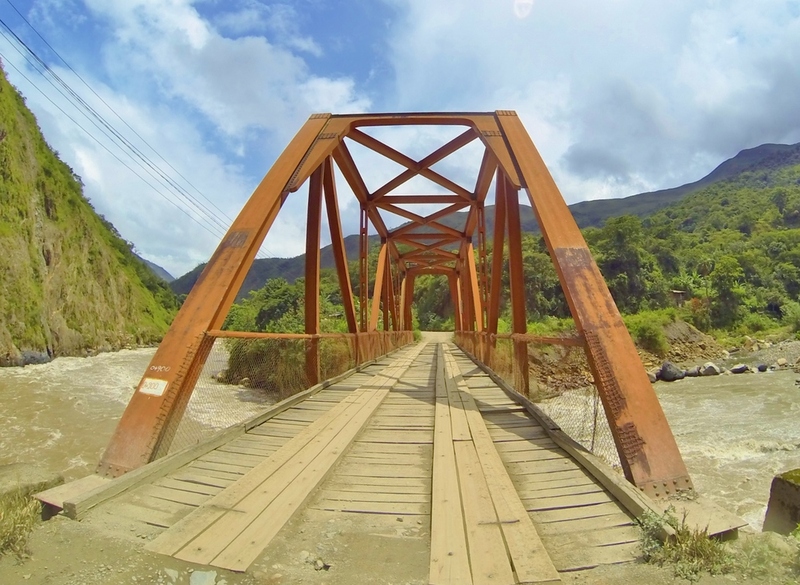 The road to Hidroelétrica leaves the pavement at Santa Maria and continues for twenty five more miles along the Urubamba River to Santa Teresa. I stopped for gas before we started down the dirt road, when the gas station manager told me he only had diesel. "No hay combustible para motos." This was not the answer I had hoped for, but most folks with significant travel experience in a place like Perú can tell you that this doesn't necessarily mean "no". 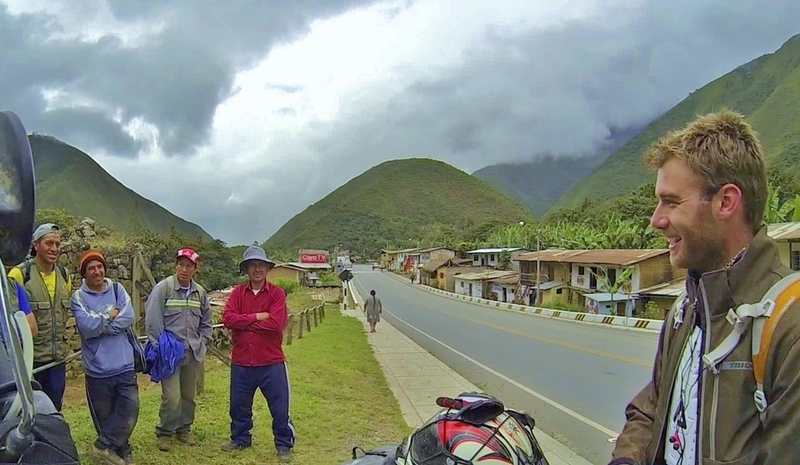 By this point my South American hustle was for more honed than when I started the trip in January, and here was another job for it. A plan arranged itself in my head as I took off my helmet and walked over to the manager. I introduced myself and my adorable Norwegian "girlfriend", who wanted to hike to Machu Picchu from Hidroeléctrica more than anything in the world. Elise couldn't speak Spanish, so she had no idea what I was saying and was masterfully playing the part of innocent blonde girl. If we couldn't get gas, I told him, it would break her little Scandinavian heart. He looked at the ground, and I could see his mustache wiggle as he thought. "Well," he supposed, "I guess there's no way you could have known about the strike....How many gallons do you need?" He nodded and yelled to someone inside as he walked away. I stood there confused, and rolled the bike over to the pump to wait. A few seconds later a kid whistled and waved me over to a small shed beside the gas station. He had me wheel the bike out of view of the people gathered in the town square. I knew that the strikes were organized all throughout the region to combat proposed government restrictions on gasoline sales, but I had no idea what kind of brutal retaliation someone possibly faced for breaking the strike in a small town like this. He lifted the lid off of a barrel in the corner of the shed and dipped a bucket in. With the first gallon in hand, he picked up a large funnel and walked over to the bike while keeping an eye on the road out front for any passersby, then began to pour. 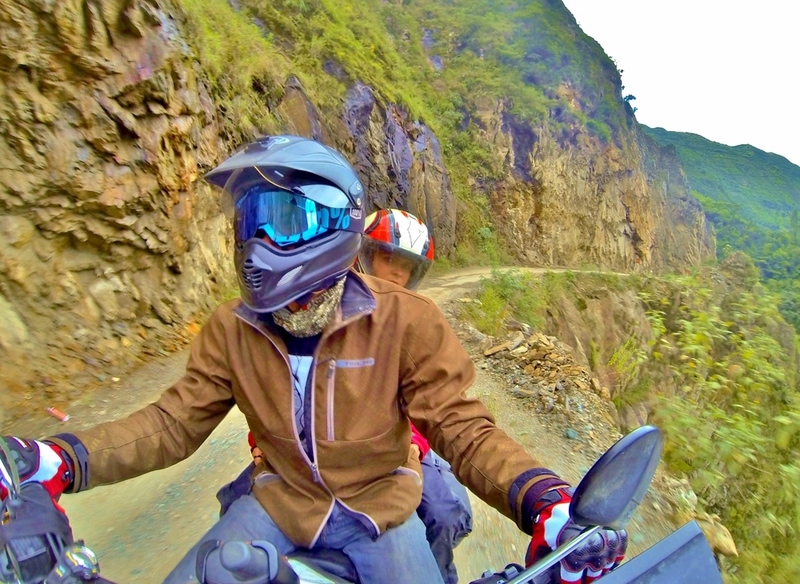 With two gallons of fresh scab gas in the tank, we hopped onto the dirt road that clung to the cliffside as it followed the winding Urubamba River south toward Santa Teresa. The continuous right, away from the river and into mountain crevices carved by waterfalls that pooled into rocky creeks over the road, and left, toward the river again ending in blind curves that had surprises by corner-cutting vans and work trucks. 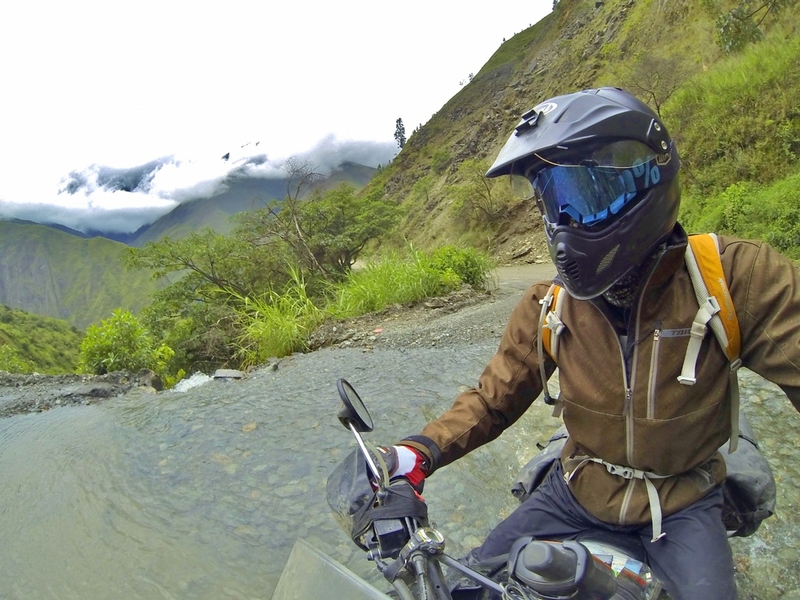 The left edge of the road was nothing but a view of the caramel-colored Urubamba River below, which grew smaller and smaller as the road slowly snaked its way to higher elevation. Late that afternoon we arrived in Santa Teresa. After freezing on the Abra Málaga, sweating through the jungle road, and managing not to fall off the cliff into the Urubamba, we rewarded ourselves with a big pizza. The next morning we got up bright and early to hustle Elise down to the train station at Hidroeléctrica, and I made a friend over breakfast. 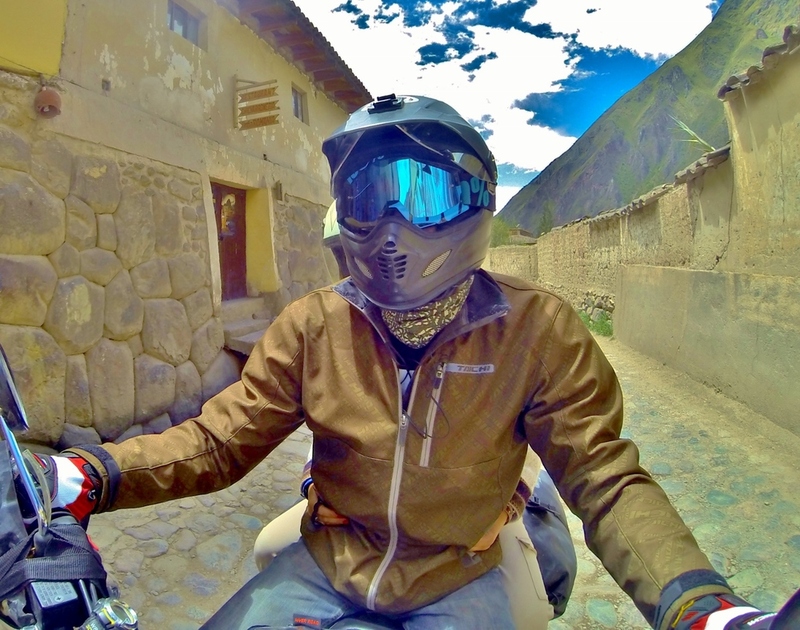 Once back in Santa Teresa, I loaded up the bike for the solo trip back to Cusco. Clothed baby. Naked woman. Enjoy your breakfast. On the way back up to Abra Málaga, I stopped at the roadside ruins of Wamanmarka near Huamanpata. I explored the small site by myself for awhile and returned to find a group of men gathered around my bike, who I later found out were responsible for maintaining the ruins. We talked for awhile about nothing in particular. Even though they spoke to me in Spanish, I enjoyed listening as they spoke to each other in Quechua. It was early afternoon, and the growing clouds promised rain. We said farewell as they headed inside and I continued down the road back to Cusco. After one more trip up and over the foggy Abra Málaga, I cruised back down into the Valle Sagrado and on to Cusco.